Amadeus released the Philharmonia Mini passive loudspeaker. Amadeus announced they are now shipping the new Philharmonia Mini passive loudspeakers, co-designed specifically for the Hi-Fi market by world-renowned architect Jean Nouvel. The Philharmonia Mini was unveiled at the High End Music trade show in Munich, Germany, last Spring. 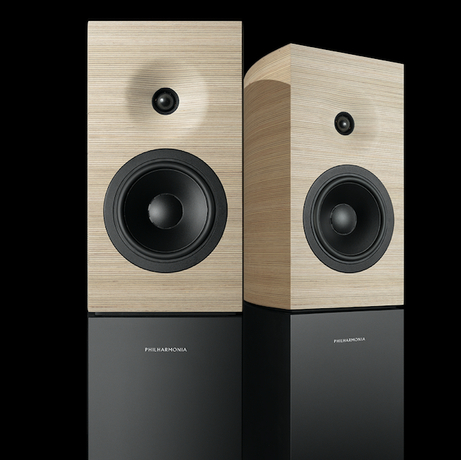 The brand-new loudspeaker design is based on the Amadeus' top-of-the line Philharmonia active model, which was initially created specifically for the Philharmonie de Paris recording and mastering studios. The new Philharmonia Mini have a retail price of €36,000 (VAT Incl.) in Europe. The Mini is a 2-way design, featuring the original Philharmonia 28mm soft-dome tweeter and a custom 170-mm woofer, offering an amplitude linearity range (±2dB) from 54 Hz to 22 kHz, and a cut-off frequency (-6dB) of 44 Hz. The high-frequency driver features very low dielectric losses and high thermal conductivity and it is loaded by a fast exponential waveguide machined in wood, which yields exceptional control over spatial dispersion. Sensitivity is 90dBSPL (2.83V/1m) and peak SPL is 112dB (1m, IEC Short Term). The design features a curved structure consisting of 288 wood veneers accurately machined, aligned and glued, offering a distinctive look and shape. The loudspeaker measures 432mm in height by 353mm in depth. The cabinets are custom manufactured from layered Birch and stand 1.23 meters tall. Bass reflex loading is provided by a unique hybrid laminar port using progressive termination inspired by the original Philharmonia. Machined into the wood material along the full height of the loudspeaker, the very low velocity port yields optimal linearity for the lowest possible distortion the company says. The pedestal contains the custom Amadeus-designed passive crossover and a pair of beautifully finished, top-quality binding posts from Japan-based manufacturer Furutech with rhodium-plated conductors.